The London Butterfly House faces an uncertain future as its lease is running out and plans to move have been withdrawn because of the cost. 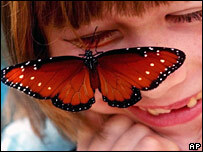 The venue, in Syon Park, west London, attracts 70,000 people a year who walk among butterflies in a glass house. But a hotel is planned for the site and plans to rebuild in Gunnersbury Park have been shelved by the government. Managers say it would cost too much to pursue the plans, but they are still looking for another venue. The butterfly house opened in 1981 and it boasts between 1,000 and 2,000 "free-flying" butterflies, supplied when they are still in chrysalis form from farms around the world. As well as its butterflies, it also has exotic birds and insects from different tropical countries. It wanted to move to nearby Gunnersbury Park, but the Office of the Deputy Prime Minister said that would require a public inquiry, which the Butterfly House says would cost them too much. It has been offered a venue in the South West, but wants to stay in London - where it is the only attraction of its kind. Spokesman Michael Crosse said: "We are trying to preserve this beautiful valued attraction for the whole of London, by asking for help with a site. "And really, since we have used all our financial reserves, for financial help [as well]." Among those sorry to hear the venue might close was Deidre King, who was visiting the house with children from the Square One nursery school. She told BBC London: "They will have to travel for miles or go to another place in the world. This is here for them. If they lose it, it will be terrible."